Rishabh Mahant has recently been selected for a job in Mumbai. He is the first person in his family to be getting a job. He comes from a rural family in Jashpur district of Chhattisgarh and his father is a farmer. Since childhood Rishabh wanted to do something different. The Livelihood College at Jashpur gave him an opportunity for that. It is a unique course, the only of its kind in Chhattisgarh, that has enabled him to get his dream job. When Rishabh learnt about the Livelihood College he saw it as an opportunity to fulfill his dreams. The Livelihood College is an initiative to turn Chhattisgarh into a hub of skilled manpower. Every district of the state has one Livelihood College. These colleges impart skill education to young men and women form various parts of the state. This initiative is in tune with Prime Minister Modi’s vision of turning India into a global supplier of skilled manpower. The Livelihood College, with its various courses is fulfilling that dream. The courses offered at the Livelihood College are so designed as to make the students eligible to get jobs in particular industries. Most of these courses are in collaboration with various organisations doing business in particular industries. The college is fully residential and it also offers free study materials to the students. The students are also offered placement assistance at the time of completion of their courses. 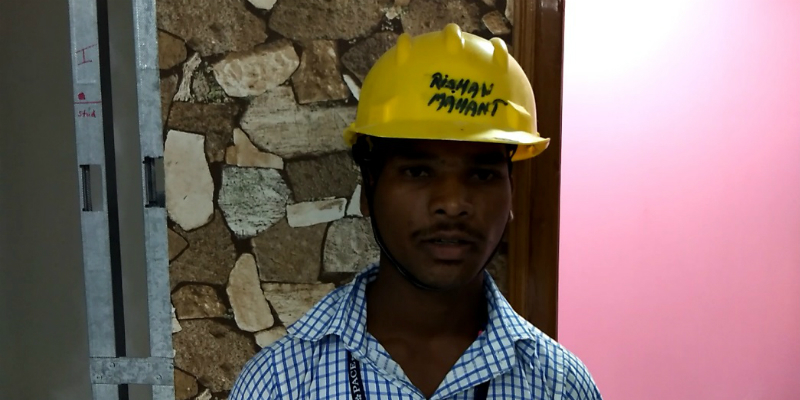 Rishabh went to the Livelihood College at Jashpur and he looked into various courses that were offered there. He liked the course on false ceilings which was a unique course. It was the only such course in entire Chhattisgarh and he saw major potential there. Therefore he took up the course and started learning the skills of the trade. “This course here has given me a lot of skills. I have learnt advanced techniques and now I a can handle any kind of work related to this. My confidence level is high.” He says. Rishabh is one of the students who have got placement and he feels that others can also get ample opportunities. He and the other boys who have been selected for jobs are an inspiration for the juniors. The construction sector is booming in India and it involves large number of skilled manpower even in this age of automations. The Livelihood College, Jashpur is trying to capture this segment and make sure that the youths of Chhattisgarh can be benefited from this in a big way. Many youths are taking interest in the course on false ceilings and they see it as an opportunity to break barriers and make it big outside their small worlds. For them, it is a means to fulfil their dreams.